Hinabangan, Western Samar—When Dr. Stephanie Asence, municipal health officer of the rural health unit in this town, learned about BDO Foundation’s health centers rehabilitation program, she seized the opportunity and sent a letter-request along with the required documents, hoping their health facility would be chosen as a beneficiary. BDO Foundation recently rehabilitated rural health units in Western Samar, Iloilo, Davao City and Pangasinan, in line with its advocacy to help improve the health and well-being of disadvantaged Filipinos. Her hopes were fulfilled when the foundation selected her health center for its rehabilitation program. 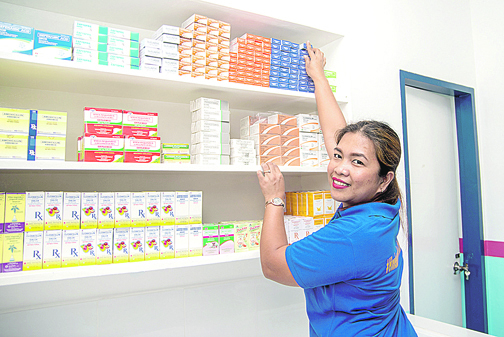 After less than three months, Hinabangan Rural Health Unit is now completely renovated—a center for health and wellness ready to deliver improved services to Hinabangnons. The health facility in Hinabangan is one of close to 70 rural health units already rehabilitated by BDO Foundation, the corporate social responsibility arm of BDO Unibank, in line with its ongoing efforts to help improve the healthcare delivery system in the country. The foundation also recently renovated the San Rafael Rural Health Unit and Birthing Facility in Iloilo, Toril Health Center in Davao City, and Mangatarem Rural Health Unit II in Pangasinan. The renovations include various rooms and spaces for mothers and infants, children, senior citizens, persons with disabilities and all other patients. New furniture and fixtures were installed. The foundation also built play areas for children complete with books and toys, waiting areas for the comfortable use of senior citizens, and breastfeeding stations for nursing mothers. These improvements enable health workers to provide their services more effectively to their constituents. The rural health units were turned over to local government officials by BDO Foundation president Mario Deriquito, BDO Foundation program director Rose Espinosa, and officers of BDO and One Network Bank branches in the provinces.